I think I have mentioned before that I am a handbag snob. I like my purse to be different and stand out in a crowd. If you share the same love for handbags, I have some very exciting news for you! I was recently introduced to the gorgeous line of designer handbags by Miche Bag, and I am truly in love. The Miche Bag presents a new line of designer hand bags like you never seen before! It's chic, fun, stylish and it's all the same bag. With the Miche Bag you can change the look of your handbag by simply changing the shell! Forget all the time and hassle of transferring your things from one bag to another with the Miche Bag you can have a new look in 3 seconds or less! I received the Miche Big Bag and two beautiful shells for review! I am truly amazed at how quickly you can change from one shell to another. I hate switching purses, because it always takes so long to move every single little item over to another purse, and then get it organized enough so that you can actually find your things! 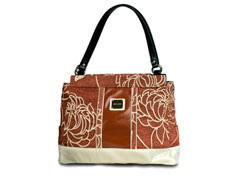 With the Miche Bag, you simple change the outside of the purse, so there is no transferring or re-organizing involved! Does it get any better than that?? Seriously, girls, it really doesn't. I also love the fact that once you have purchased the bag of your choice, there are tons of shell options! The shells are inexpensive, so each time you purchase one, it is like you are getting a while new purse, for half the price! I look back at all of the designer handbags that I have purchased in the past and think of all of the money that I spent. If only I had known about Miche Bag! I would highly recommend Miche Bag to anyone who loves handbags! You truly can't go wrong with a Miche Bag! BUY IT! You can purchase your own Miche Bag and shells at http://www.michebag.com/ . WIN IT! One extremely lucky winner will receive their own Miche Bag and shell! Visit http://www.michebag.com/ , then come back here and tell me which is your favorite shell! Follow me on Twitter and tweet about this giveaway! 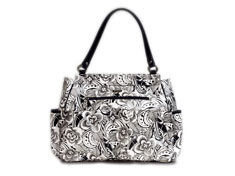 (Leave your Twitter name and a link) You can tweet this daily: " Miche Bag Giveaway at Opinions of a Moody Mama #giveaway @coopersmommy @michebagdotcom http://tinyurl.com/33j9r44 PLEASE RT!! " The Dani is my favorite!!! I like the Ashley shell. Love the Big Bag and can't decide between the Robin and Erin shells. I love the Noel, but if it is still out of stock I'd choose the Taylor. Voted for you at Mommies Faves Top Blogs. I entered the JK Vinyl giveaway. 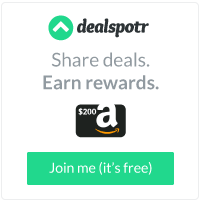 I entered the Intelleceuticals giveaway. I entered the Band Angels giveaway. I entered the Marshalls and TJ Maxx giveaway. I like the Hilary shell. I like the Danielle and the Chloe. There's a number of shells that I love. I really like the Jayma shell. Thanks so much. My favorite is the Jen (copper). Signed up for Juno Baby newsletter. Like Miche bag on Facebook. Twitter follower of Miche bag. I love the Brandi shell reminds me of Texas! My fav shell is "Katherine"
Of the big shells, my favorite is the Lauren and from the small shells I like the Madelynn. I like the Grace Shell. I love the Abbie shell. "Grace" is the cutest! Love it! I also entered the TJ Maxx giveaway. My fav. is the Lexi! Thanks for the chance to win! I follow miche on twitter! My favorite is the Naomi.